Our adjuster was assigned to obtain a statement from a witness who could only meet with him during work hours. The unique problem was that the witness worked inside the ultra-high-security vaults of the Federal Reserve Bank of Los Angeles and told our adjuster that it would therefore be impossible to meet with him. 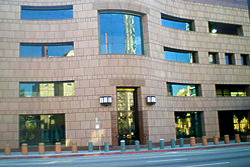 Our client had absolutely insisted on an in-person statement with the witness, so the adjuster got on the phone and after a considerable amount of time and effort was able to get through to the Federal Reserve Bank, persisting until he was able to speak with the right person who could get him inside this imposing Fort Knox of a building. He learned that it WAS possible to gain access to the building providing he was willing to go through a lengthy pre-screening process to ensure he was who he said he was and without criminal connections. The adjuster answered a lengthy list of personal questions and provided a huge amount of information and accreditations so that background checks could be run. Being of good and honest character, the adjuster passed the pre-screening and was granted access to the building. Once inside, he realized that the security gauntlet had yet to really begin. A total of 6 separate security checkpoints followed in succession as he laboriously made his way through various rooms, tunnels, halls, stairways and elevators to finally reach the witness. Along the way he was amazed to see huge stacks and entire rooms full of currency worth billions of dollars. The adjuster got the statement and completed the assignment, which turned out to be favorable for the insured and the claim was able to be settled accordingly.